For today’s deals roundup, we’ve prepared a list of the best smartphone deals on the internet right now. We have found deals on brands like Huawei, Samsung, Xiaomi and more. If you’re thinking of replacing your old smartphone, then you’ve come to the right place. 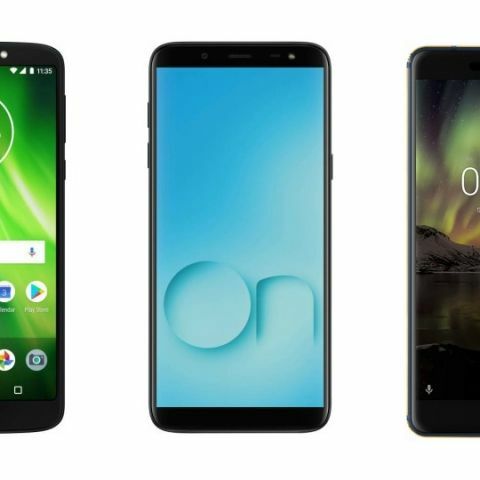 We covered a bunch of deals on smartphones across three major platforms Amazon, Flipkart, and Paytm Mall. The Samsung Galaxy On6 sports a 5.6-inch HD+ super AMOLED Infinity Display. The device is backed by a 1.6 GHz Exynos octa-core processor, which is paired with 4GB RAM and 64GB of internal memory. Click here to buy. The Oppo F7 sports a 6.23-inch full HD display with a resolution of 2280 x 1080 pixels. The device features a 2.0 GHz MediaTek P60 octa-core processor with 4GB RAM and 64GB of internal memory. The smartphone runs on Android Oreo 8.1. Click here to buy. The Moto G5s Plus features a 2.0GHz Snapdragon 625 octa-core processor with 4GB RAM and 64GB internal memory. When it comes to the camera, it has a 13MP + 13MP dual camera at the back, while the front is equipped with an 8MP unit. Click here to buy. The Honor 7X sports a 5.93-inch full HD display with a resolution of 1920 x 1080 pixels. The device is backed by a 2.36GHz Kirin 659 octa-core processor. This variant comes with 4GB RAM and 64GB of internal memory. It has a 16MP + 2MP dual-lens at the back while at the front, the smartphone is equipped with an 8MP unit. Click here to buy. The Moto G6 play features a fingerprint sensor that lets you unlock your phone. It has a 13MP lens at the back, while the front is equipped with an 8MP sensor. The device comes with Android 8.0 Oreo and is powered by a 1.4GHz Snapdragon 430 octa-core processor. Click here to buy. The Nokia 6.1 sports a 5.5-inch full HD display with a resolution of 1920 x 1080 pixels. The smartphone is backed by a 2.2GHz Snapdragon 630 octa-core processor, which is paired with 4GB RAM and 64GB of internal memory. It has a 16MP primary camera with ZEISS optics and an 8MP lens at the front. Click here to buy. The Samsung Galaxy S8 is a water-resistant device, which comes with a 5.5-inch quad HD+ display. The smartphone is equipped with a 12MP camera at the back, while the front has an 8MP sensor. The device is equipped with 4GB RAM and 64GB of internal memory. Click here to buy. which is the best selling smartphone of 2014?